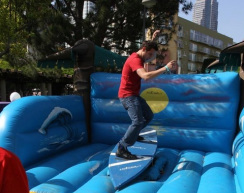 Portable Water Park - Interact Event Productions - Corporate Event Planning at Wholesale Prices! This is our premiere water park attraction! Ride the 30' waves and live to tell your friends about it. This is a double bay slide so it means more fun for more people. Perfect for picnics, school functions and VBS! 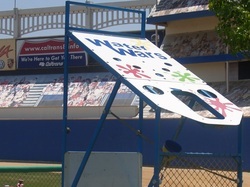 Create your own customized portable water park. Choose from any of these great water park choices. From small kiddie slides to the Wild Wave over 25' high! Co-Ops receive an additional 10% off regardless of the number of items. Co-ops provide responsible adult volunteers to assist in the ride supervision of inflatable waterpark items. Minimum (2) volunteers per attraction. This is the world's greatest water balloon fight competition!! Participants stand on opposite one another in their designated "Load & Launch" area and fling water balloons. This is a slip n slide on steroids. 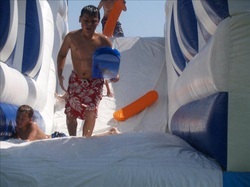 Run, jump and soar down the slip n slide at rapid speed. Fun for ages 7 to 99! Single Bay Slide, great for smaller events. This is a great value if you are looking to entertain guests. It's front entrance allows parents to supervise their children easily. This is the largest water slide of it's kind in the industry. 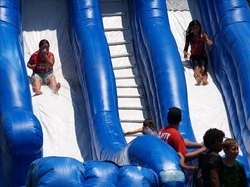 With a crazy free fall drop straight down that shoots you across the slip n slide. This unique water maze is high enough to hide behind but low enough to allow spectators to watch. Our water guns are high action, high speed and fast loading. We don't mess around, this is tag on steroids! Hang ten our knarley surf simulator. Find out how long you can ride the wave just like the pros do.